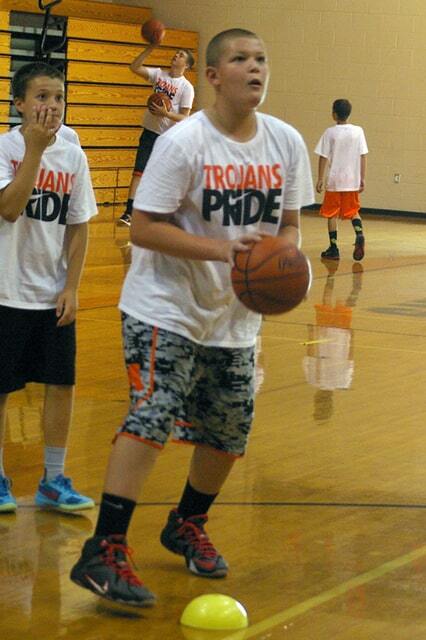 A total of 39 boys in the fourth through sixth grades attended Arcanum’s youth basketball camp this week. ARCANUM – Arcanum’s youth boys basketball camp drew 39 boys in the fourth through sixth grades for a four-day camp this week in Arcanum. The attendance was up slightly from last year’s camp, which was the first Marcus Bixler led as the Trojans’ varsity boys basketball coach. Bixler led the camp along with his high school basketball players. The week was split into a pair of two-day minicamps with Monday and Tuesday focused on ball handling and Wednesday and Thursday focused on shooting. “We’re just kind of focusing in on some of the offensive fundamentals, making sure we’re good there and they have a plan kind of moving forward so they’ve got something to take with them after this week’s over that they can be working on,” Bixler said. The youth were put through the same drills the high school players go through. The camp stressed fundamentals and taught the boys drills they could continue to do after the week ended. Bixler saw a lot of growth from the campers throughout the week and saw a tremendous amount of progress from last year’s camp.